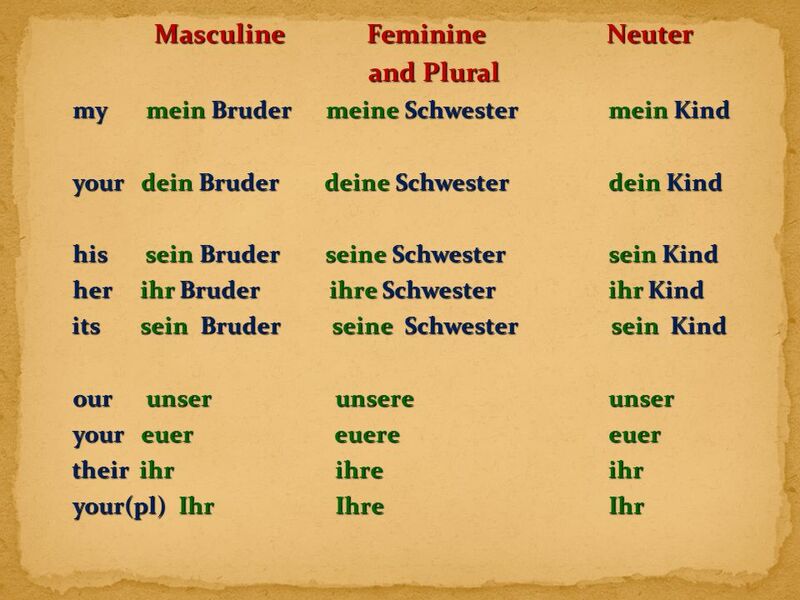 2 As you have already learned, GENDER plays an important role in the German language. As you have already learned, GENDER plays an important role in the German language. All nouns have a gender. All nouns have a gender. The gender of a noun is identified by its DEFINITE ARTICLE, der, die, or das. The gender of a noun is identified by its DEFINITE ARTICLE, der, die, or das. 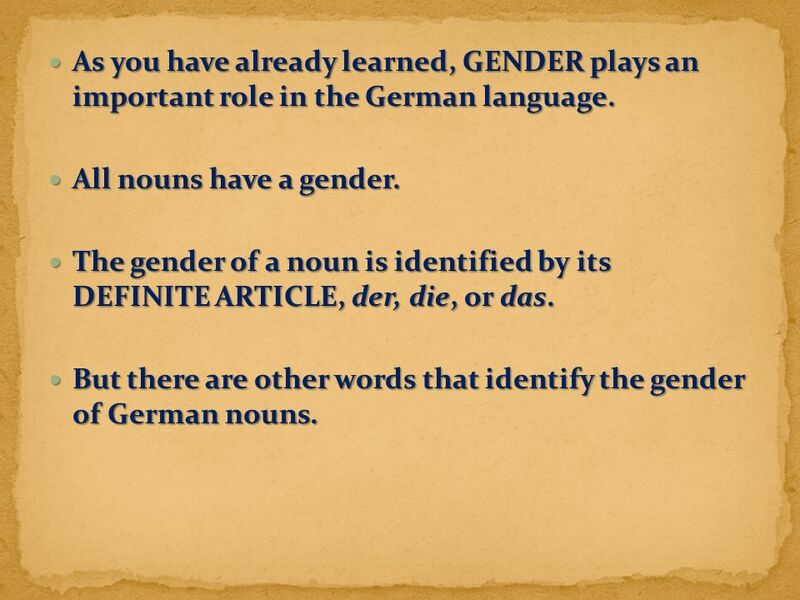 But there are other words that identify the gender of German nouns. But there are other words that identify the gender of German nouns. 3 Gender is also identified by the INDEFINITE ARTICLE, the word that means “a” or “an”. Gender is also identified by the INDEFINITE ARTICLE, the word that means “a” or “an”. The INDEFINITE ARTICLE replaces the DEFINITE ARTICLE. The INDEFINITE ARTICLE replaces the DEFINITE ARTICLE. 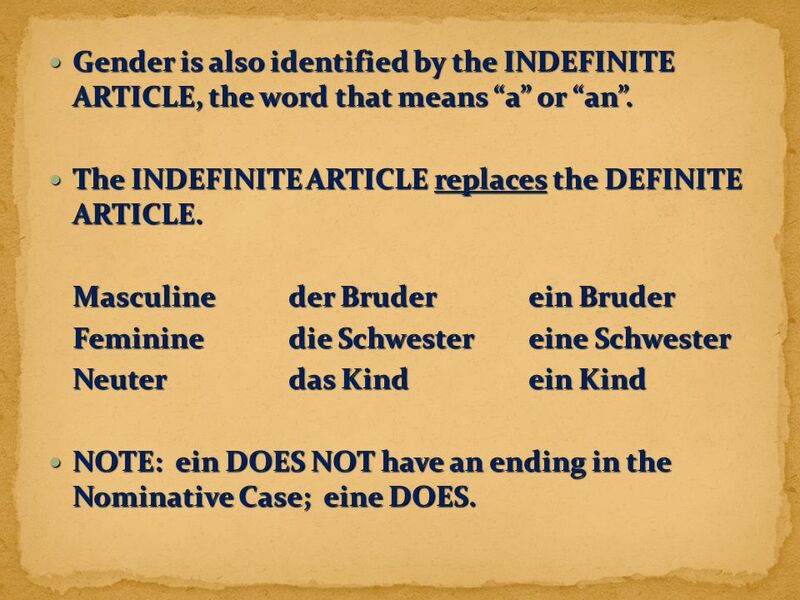 Masculine der Bruder ein Bruder Masculine der Bruder ein Bruder Feminine die Schwestereine Schwester Neuterdas Kindein Kind NOTE: ein DOES NOT have an ending in the Nominative Case; eine DOES. 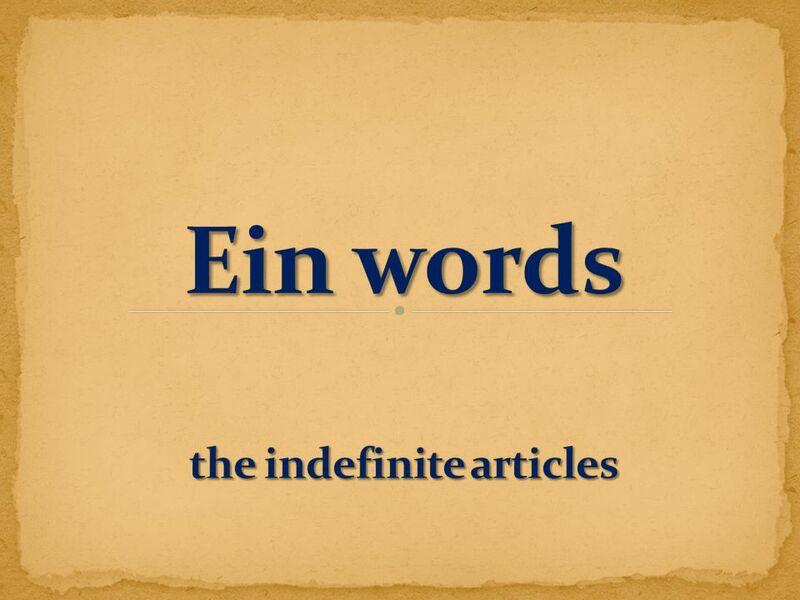 NOTE: ein DOES NOT have an ending in the Nominative Case; eine DOES. 4 The INDEFINITE ARTICLE is part of a group of words known as the “ein words”. The INDEFINITE ARTICLE is part of a group of words known as the “ein words”. The other words in this group are the possessive adjectives, the words that mean my, your, his, her, etc. The other words in this group are the possessive adjectives, the words that mean my, your, his, her, etc. The possessive adjectives use the EXACT SAME endings as ein and eine. 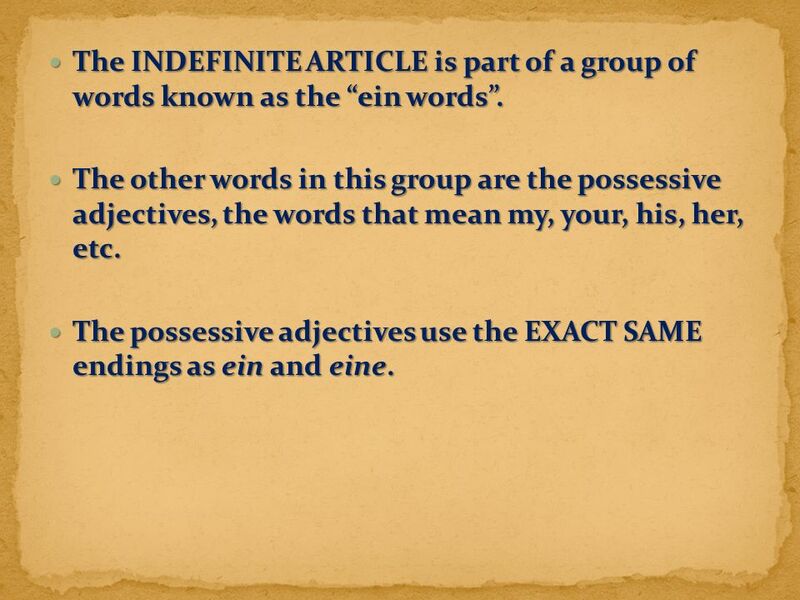 The possessive adjectives use the EXACT SAME endings as ein and eine. Herunterladen ppt "As you have already learned, GENDER plays an important role in the German language. As you have already learned, GENDER plays an important role in the." Deutsch 1 Lesson 6 den 30. April 2014. 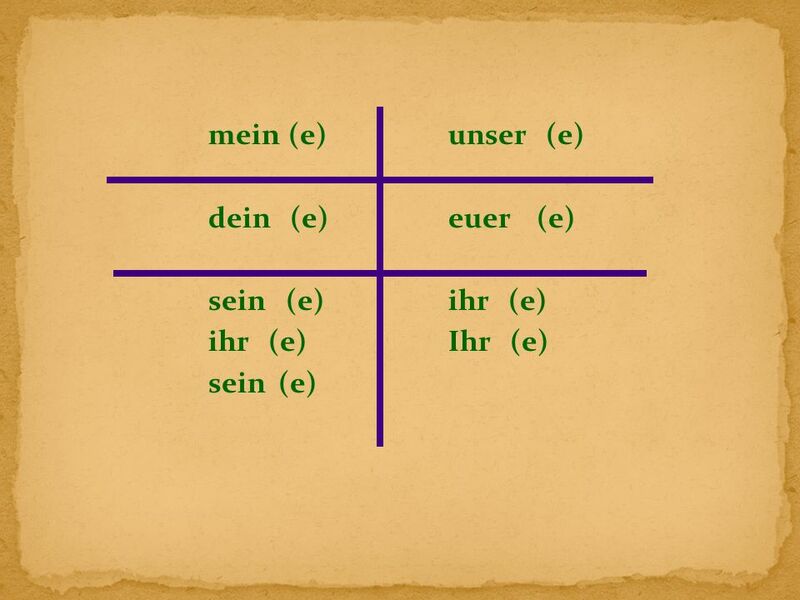  What do all German nouns have in common? Revision.